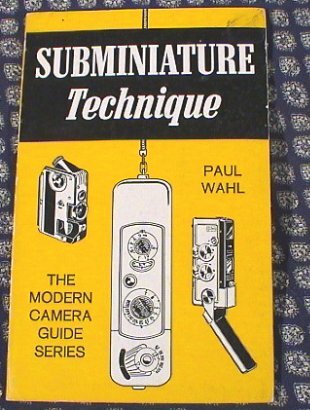 Paul Wahl, Subminiature Technique, The Modern Camera Guide Series. 1960 -128page soft cover page. William White considered this the best book on subminiatures, at the time. Unlike some books that focus on a particular manufacturer, this book offers advise that is useful for anyone using a camera with a smaller format. In these well-illustrated pages, you will find help in selecting the subminiature best suited to your needs, and you will learn to use this camera effectively in a variety of photographic situations. Camera Features: film size, lens, viewfinder, focusing, shutter, film advance and shutter cocking, cassettes, film transport, number of exposures, built-in exposure meter, camera size, shape and weight, ease of operation, versatility, accessories, quality. Also Techniques of Subminiature Photography. Reviews Cameras: GaMi 16, Minox B, Minox III-s, Minicord III, CamBinox, Echo 8, Mamiya Automatic 16, Mamiya Super 16, Mec 16, Mec 16B, Mikroma II, Minolta 16, Ricoh 16, Steineck A-B-C, Stylophot, Yashica Y-16.